Diesel Common Rail & Engine Management is a two day technical course, aimed at vehicle mechanics, technicians and apprentices. The course explains diesel common rail fuel system technologies, system variants, engine management, diesel exhaust gas after-treatment systems and diesel diagnostic procedures. During the first part of the course, you will learn how the diesel common rail & engine management system components work. You will learn about the fuel supply and delivery system variants and the different engine management control functions. You will learn how to test the diesel common rail low pressure and high pressure fuel systems and what to look for. 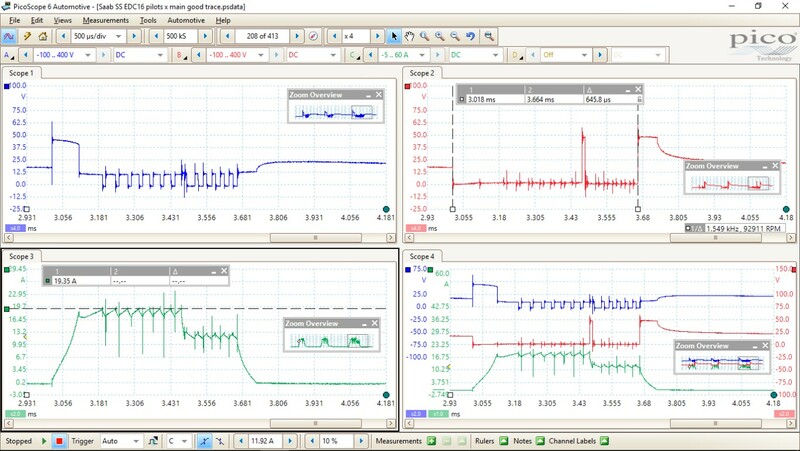 The course covers measuring injector leak back, testing injector control circuits using an oscilloscope and evaluating injector correction values using the scan tool. To book a place on the next available course, please contact Tony Kitchen at AK Automotive directly. The course explains fuel system start up requirements and how to diagnose the diesel common rail fuel system using test instruments, scan tool and oscilloscope in conjunction with wiring diagrams and technical information from Autodata. The second part of the course covers Diesel Particulate Filter – DPF and Selective Catalytic Reduction – SCR technologies. The course covers glow plugs control systems including pressure sense glow plugs, and the exhaust gas re-circulation system – EGR. 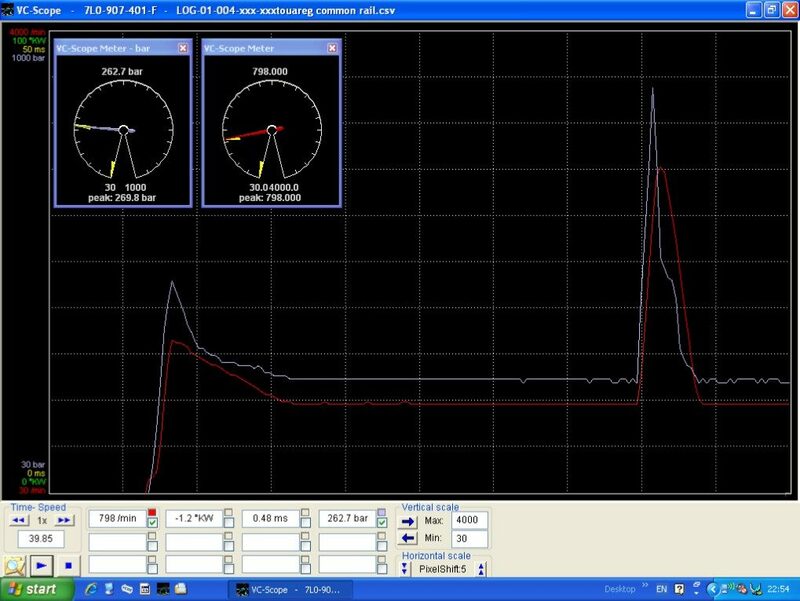 You will learn about diesel turbo boost control systems for variable vane and wastegated turbos and how to test the turbo boost output. You will learn to evaluate live data and gain knowledge of the various service, configuration, calibration and reset procedures that apply to diesel common rail & engine management control systems. The course comprises workshop sessions on live vehicles supported by presentations, technical discussions and case studies of real time diesel common rail faults using captured live data and test readings. At the start of the course, you will receive a detailed set of course reference notes for use during the course and take away at the end. 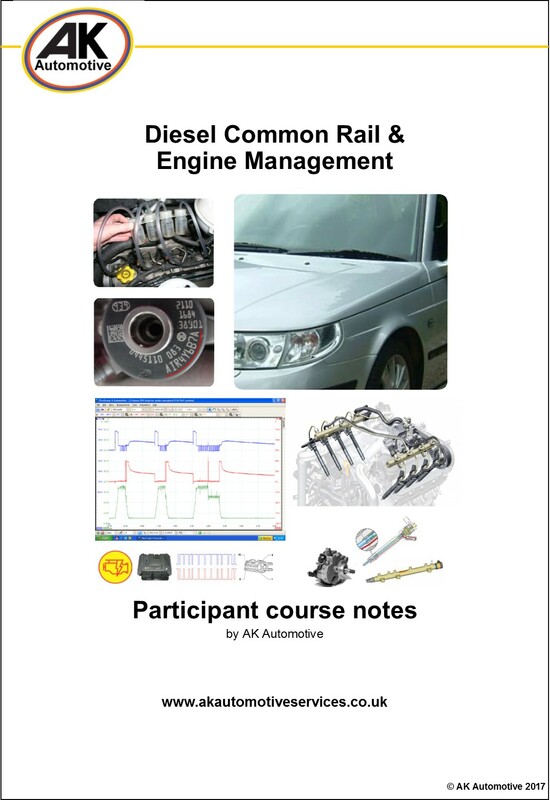 Course notes contain detailed technical descriptions supported by illustrations, photographs and live data screen captures to explain how diesel common rail and engine management systems work. By the end of the course, you will have gained a detailed working knowledge of diesel common rail and engine management systems. You will be able to apply what you have learnt to carry out cost effective diagnostic repairs to your customers’ vehicles. At the end of the course, you will receive a Certificate of Professional Development from AK Automotive in recognition of your attendance. Candidates must have a motor industry or other relevant technical background (emergency services and ex-military – R.E.M.E. welcome). Candidates should understand electrical theory and circuit testing techniques, be competent with use of test tools, oscilloscope and scan tool and be able to read wiring diagrams. PC skills are useful at this level. AK Automotive supply training and technical support services to motor industry customers throughout the UK and overseas. The website is updated regularly so please have a good look around and contact us for further information.